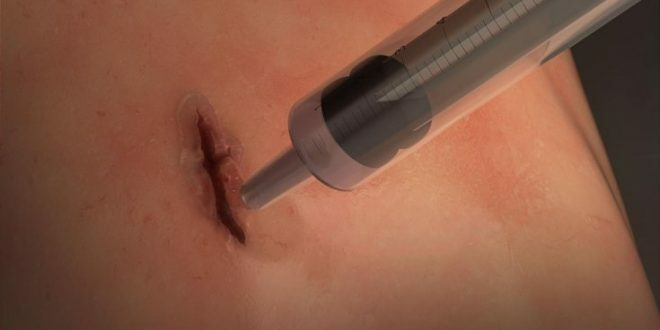 A highly-elastic glue could be the future of treating wounds inflicted in car accidents or war zones, after it was shown to successfully seal open incisions in less than one minute. The glue, dubbed MeTro, is based on a hybrid-elastic protein and can be applied on external or hard-to-reach internal wounds to seal them up in just 60 seconds — much quicker than conventional sealants such as stitches and staples — and help with the process of healing. Though the adhesive has only been tested on rodents and pigs, the engineers working on the groundbreaking invention believe it could radically redefine emergency surgeries by sealing wounds on the skin or on body tissues (lungs, heart, arteries) that are always expanding and relaxing and are at risk of reopening. The results from their animal trials were detailed in a paper published in Science Translational Medicine. The envisioned applications of this glue are not restricted to hospital surgeries alone. Once developed and tested on humans, the elastic adhesive could be used as an instant solution to seal serious wounds at the site of an accident or in war-zones. How does the MeTro glue work? Once applied on an open wound, MeTro solidifies into a gel-like formation, filling the gaps of the wound and conforming to its shape. Then, it is further treated with UV light to stabilise and further settle into the incision. “This allows the sealant to be very accurately placed and to tightly bond and interlock with structures on the tissue surface,” says assistant professor Nasim Annabi, lead author of the study who also oversaw the application of the new sealant in various clinical settings and conditions. The glue carries an inbuilt enzyme that allows it to degrade once the sealed wound has taken up sufficient time to heal. It is worth noting that this enzyme can be modified to last according to wound types. This could be just a couple of hours or a period going up to months. Comparing the application of MeTro to the process of sealing tiles using silicone sealants, professor Anthony Weiss, another member of the research team, said, “It responds well biologically, and interfaces closely with human tissue to promote healing”. The gel is easily stored and can be squirted directly onto a wound or cavity, he added.